NIOSH Mining currently lists all mining disaster data on a Historical Mine Disasters page. To correct a reporting error about a mine accident that occurred more than a century ago, we recently updated our online resource tables listing all mining disasters and metal/nonmetal disasters, as well as the graphs displaying all mining disasters and metal/nonmetal disasters. Previously, these online resources had reported that 14 fatalities resulted from a cave-in at the Shakespeare Placer gold mine in Dome Creek, Alaska, on September 28, 1911. In fact, the 14 miners involved in that accident were all rescued, so the incorrect data has now been removed from our disaster tables and graphs. The process of correcting the error began with an e-mail from the United States Mine Rescue Association (USMRA), and verifying the accurate information involved a bit of detective work by NIOSH Mining staff members. 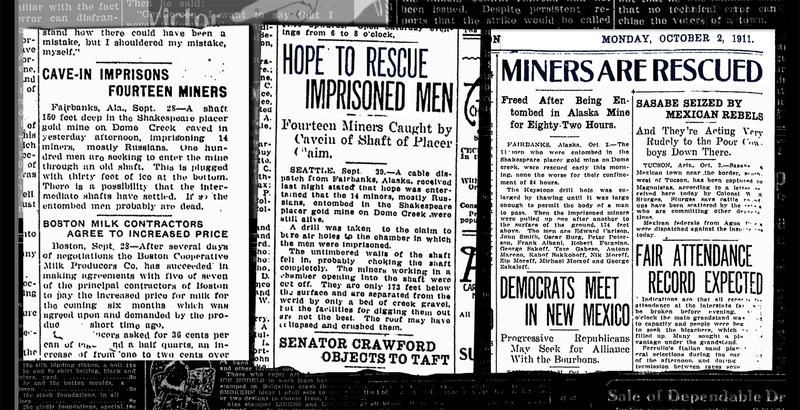 Scans of the 1911 newspaper accounts of the Shakespeare Placer mine accident and rescue. The first newspaper accounts immediately after the accident did indeed report that the miners were unlikely to be alive. Although the miners were known to be only 173 feet below the surface, the untimbered walls of the mine shaft had collapsed, likely choking the shaft completely and burying the men. But hopeful rescue efforts continued from the surface: A steam pipe was used to thaw the frozen ground and furnish heat to the trapped men, and a hole was drilled to supply necessities. A few days after the accident, the Spokane Daily Chronicle reported that a “drill hole was enlarged by thawing until it was large enough to permit the body of a man to pass. Then the imprisoned miners were pulled up one after another to the surface of the ground.” The article also listed the names of the 14 trapped men. 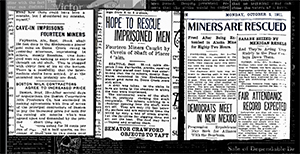 The email from the USMRA included the above newspaper clipping from 1911 as well as several others from newspapers in various states, and all of the articles described rescues, so the source of the incorrect data was clearly not the newspaper accounts. Seeking the origin of the error, NIOSH Mining staff searched online newspaper records and copies of previous government reports. The earliest record we could find of the incident being incorrectly reported as a disaster—a classification used by the Mine Safety and Health Administration (MSHA) for incidents resulting in five or more fatalities—was a U.S. Bureau of Mines report from 1949. That source misreports the accident as a disaster, with 14 lives lost, in a data table, and subsequent publications that included the incorrect data would have been derived from this Bureau of Mines report. Research by NIOSH Mining staff also found one other source verifying the rescue with further detail beyond the newspaper accounts. The Noel Wien Public Library in Fairbanks supplied information from a book called Dying for Alaska Gold, which describes the dramatic rescue mission involving 32 hours of continuous drilling until the men were reached, and the 5-inch tin cylinder fashioned to lower supplies into the hole until it could be widened. Finally, an MSHA library staff member checked newspaper archives, geologic survey data, and census records to verify the names given in the newspaper accounts of the rescued miners. Based on that information, the staff member determined that the 14 men were indeed rescued from the mine in 1911. Data from our Historical Mine Disasters page are used to track trends and changes in mining disasters over time, sometimes going back to 1839, so supplying accurate information to the public on this page is critical. In addition to being appreciative of the USMRA e-mail alerting us to the incorrect data, NIOSH Mining is pleased to verify that the Shakespeare Placer gold mine cave-in, previously reported as a disaster, actually ended in 14 saved lives.